Miwa Komatsu is an artist from Nagano, who has painted, drawn and carved an astonishing number of works during her career. This is a collection of works and also her digital photo album. In the 2015 Chelsea Flower Show, Miwa carried out a special collaboration with well-known landscape artist Kazuyuki Ishihara, and created two ‘komainu’ guardian lion-dogs made out of Imari porcelain for exhibition in his show garden. In this e-book, the producing process of the guardian dogs KOMAINU is published.In addition, the reader can feel the world of Miwa Komatsu. Story book"Nobody Taught me!" is also recorded. 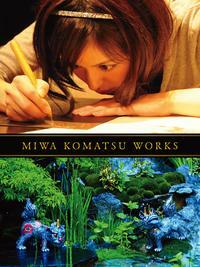 Enjoy the various challenging expressions and unique world of Miwa Komatsu.